He is not loving the chores. 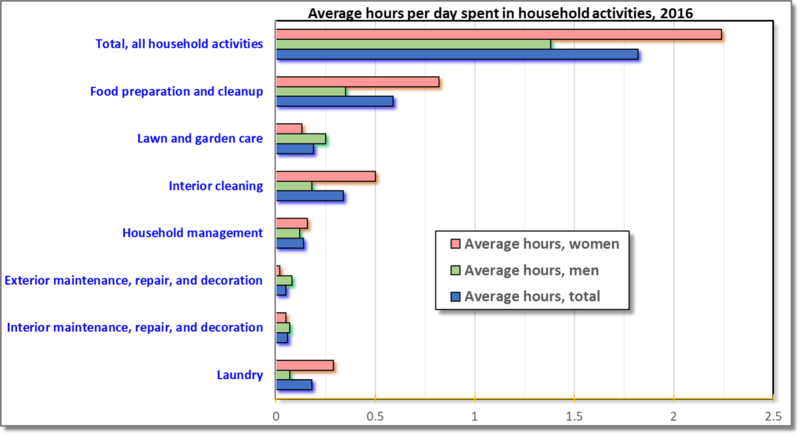 The daily hours spent in household activities, 2016. (Click on the image to enlarge) The average time a US household spends on daily chores is approximately two hours. Most of that time goes in cooking and cleaning. However, just 0.5 hour of food preparation and cleanup is surprisingly low, compared to what most of the world spends in collecting, foraging, growing & cooking food. Even in the western countries, US is an outlier due to a culture of eating out, the advancements in food processing & easy access to inexpensive ‘junk food’. On the flip side, this has resulted in a growing obesity problem and healthcare spending per person that is more than any other developed country. Men spend almost an hour less than women in household activities. Since a lot more families have men working in jobs while women raise the kids, this isn’t surprising. Men spend more time on physically demanding activities, e.g., moving the lawn and fixing the house. Since these are not done as frequently and as many hours as cooking and cleaning, this data does suggest that women end up doing more household chores than men.